The potential promenade shut down had Downtown Brooklyn residents riled up, but now they are livid. The building located on 80 Flatbush, is said to be part of an upcoming project, which, when finished, will leave the building standing at 840 feet. “9 DeKalb, set to stand at over 1,000 feet, people are complaining of noise pollution, light obstruction and cramped sidewalks,” Bosworth wrote. Some residents are now unable to see the views that initially drew them to the neighborhood due to construction. Bosworth reported that “local groups like the Rockwell Place Bears Community Garden are fighting back against the development. 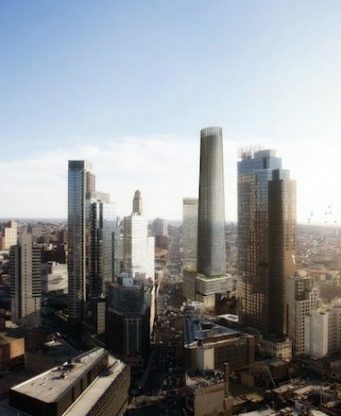 The Garden has pointed out that in its current location, only a block north from the impending 80 Flatbush, most of its light may be blocked by the rising towers. “Developers, however, are trying to make amends. Still, one could argue that with the potential promenade shut down and now buildings on the rise, Downtown Brooklynites are justifiably discontent.